Aaron Rodgers, quarterback, Green Bay. That 38-13 win over the Giants was a ridiculous game. How do you figure, particularly against a team with New York’s defensive fortitude and cover ability, that Rodgers is going to have four touchdowns, no picks, no turnovers and throw for 362 yards … after struggling for the first 25 minutes? We are watching one of the great quarterbacks of our lives, with the kind of pocket presence and feel for the rush and touch on his throws that are second to none in football today—which is saying something, because Tom Brady is still playing, and playing remarkably well. Justin Britt, center, Seattle. This is not to diminish the great game of Thomas Rawls (27 carries, 161 rushing yards). The interior Seattle line, as embattled a line as there is in football, was superb in opening holes and driving the Lions off the ball in their 177-rushing-yard performance in Seattle’s dominant win. Britt made the key block on three big Rawls runs, and was aided by two big clear-out blocks by left guard Mark Glowinski. This is the formula Seattle used in the Marshawn Lynch era—win time of possession (Seattle had the ball for 36:39), give Russell Wilson enough time to make plays (mostly, he had that time) and don’t turn theh ball over. Among all the winning teams this weekend, the single most surprising element, in a positive way, was the performance of the Seattle offensive line. Britt, the Seahawks’ second-round pick in 2014, was huge in that performance. 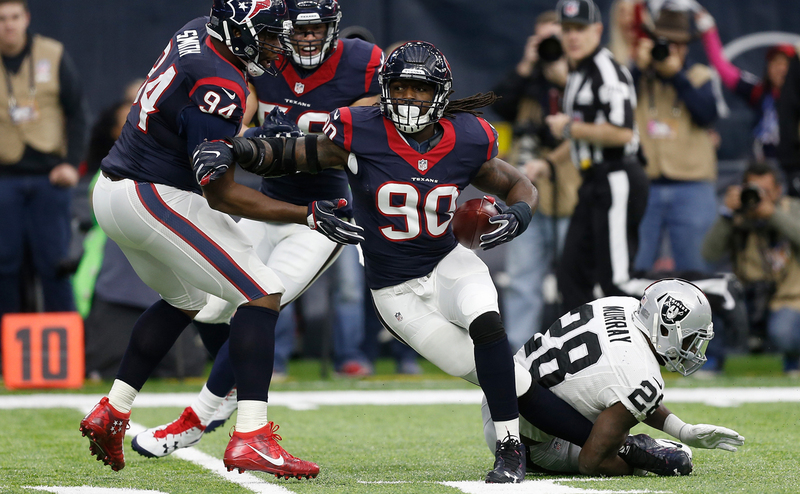 Jadeveon Clowney’s interception put the Raiders in an early hole and the Texans took advantage. Matt Prater, kicker, Detroit. He kept it a one-score game at halftime in Seattle (10-3) with a 51-yard field goal late in the second quarter, then kicked a 53-yarder in the third to cut the Seahawk lead to 10-6. Not an easy night to kick, with 33-degree wind chill and a fairly rock-hard ball in the conditions. The Lions easily could have been zipped in the 26-6 loss without the leg of Prater. Tom Cable, offensive line coach, Seattle. All season I (and many of my peers) have derided the front five of the Seahawks. Not this weekend. The Seahawks offensive line opened holes for 177 rushing yards and largely protected Russell Wilson (except for three sacks on 36 pass drops) and in general repaid the faith that Cable has shown in this group all season. Particularly notable was the work of center Justin Britt and left guard Mark Glowinski, who both should get a large chunk of the headlines that will go to Thomas Rawls for his 161-yard rushing game. Excellent work by Cable and the Seattle offensive staff. Bobby Rainey, kick returner, New York Giants. With 18 minutes left at Green Bay, and the Packers kicking off after taking a 21-13 lead, kicker Mason Crosby booted one toward the left pylon of the end zone. Rainey inexplicably caught it and lunged out of bounds at the 3-yard line. Had he let it go, the Giants would have had the ball at either the 25 (touchback) or at the 40 (out of bounds). The Giants went three-and-out and the Packers responded with a short-field field goal and then a touchdown on their next series. Ball game over. The Pittsburgh defensive front. You cannot pick just two Steelers, or three or even four. The right combination of the first playoff weekend—in fact the perfect combination—was the symphonic play of the Steelers in shutting down the Miami running game, the same rushing attack that doomed Pittsburgh back in October. Let’s look at these five men, who made life miserable for the Dolphins for three hours: Lawrence Timmons, James Harrison, Ryan Shazier, Bud Dupree and Stephon Tuitt had 40 tackles, three sacks, seven quarterback hits, a forced fumble and a fumble recovery. This was a classic Steel Curtain performance by a defense determined to make amends for an October loss in Miami. 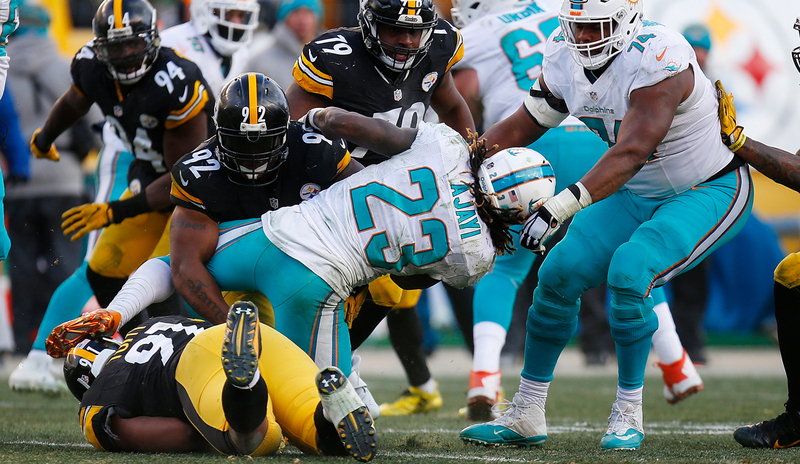 The Steelers held Jay Ajayi to 2.1 yards per carry, his lowest output of the season. • Jay Ajayi rushes of more than 10 yards in game 1: 7. • Jay Ajayi rushes of more than 10 yards on Sunday: 0. In his last 26 series of the season, Chicago quarterback Matt Barkley threw 10 interceptions. In his last 85 series of the season, New England quarterback Tom Brady threw one. Postscript on the MVP voting: I wrote a couple of weeks ago that of the 61 men to have won the NFL’s MVP trophy in its 59 seasons of being awarded (twice there were ties for the MVP), none had ever missed a quarter of his team’s games, as Tom Brady did this year—making it difficult for him to catch the field. But one winner did miss three of his team’s 16-game slate: Joe Montana of the 49ers in 1989. It’s because in 13 games, Joe Montana might have had the best year by a quarterback in the then-70-season history of the NFL. Montana set a league record with a 112.4 passer rating (18.3 points higher than any other quarterback that year), was more accurate (70.2 percent) by 7 percentage points than any quarterback that year, led the league with a plus-18 touchdown-to-interception differential, and was nearly a yard better than any other passer in yards per attempt, at 9.1. Brady, of course, was superb in 2016. But he didn’t finish first in any of the major passing categories. The MVP is always a contentious debate, and it should be; this is the biggest individual award that there is in football. But Montana had a historic season in 1989, and almost certainly the best one he ever had. That’s why he won the MVP despite missing three games.